In the field of automation, NEUHÄUSER offers complete solutions and components that are matched to each other down to the smallest detail. 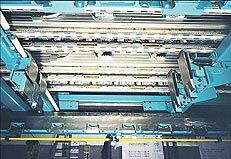 Stacking and de-stacking plants as well as toothed belt and vacuum conveyors are designed and manufactured in switchable and non-switchable variants to meet the individual customer requirements. All plants can additionally be equipped with the appropriate control systems or power electronics. Another example of innovative NEUHÄUSER technology is the newly developed and patented vacuum technology. 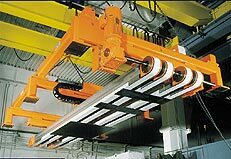 It permits the flat-top or suspended transport of non-ferrous sheets and other materials. This technology, which has been applied with great success in the automotive industry for some time, can also be used in combination with NEUHÄUSER magnet conveyors for stacking and de-stacking operations.